KIEV, Ukraine -- Ukraine is considering capital controls to prevent short-term investments from fueling volatility in the country’s currency, the hryvnia, Deputy Premier Serhiy Tigipko said in an interview. “I’m certain that it’s necessary to carefully monitor the so-called hot capital which will be entering Ukraine,” Tigipko, 50, said in Washington, where he is taking part in the annual meeting of the International Monetary Fund. Countries from Brazil to South Korea are struggling to prevent speculators from affecting their currencies as policy makers warn of a “currency war” to boost exports through weaker exchange rates. Brazil on Oct. 4 doubled the tax on foreigners’ purchases of fixed-income assets to 4 percent to stamp out a rally that pushed the real to a two-year high this week. Central bankers in Colombia and Costa Rica last month initiated programs to buy dollars to curb currency gains. The National Bank of Ukraine has been buying and selling foreign currency in a bid to stabilize the hryvnia after the global financial crisis triggered the country’s worst recession since 1994. The hryvnia fell 45 percent against the dollar in the 12 months through August 2009, making it the worst performer among more than 170 currencies tracked by Bloomberg. The Ukrainian currency has fallen 0.7 percent against the dollar since Sept. 1, after strengthening for the previous eight months. It was little changed yesterday at 7.945 per dollar. The central bank sold $686.9 million on the interbank market last month to arrest the hryvnia’s decline, the bank reported Oct. 6. The IMF, which approved a $15.2 billion loan for Ukraine in July, its second for the former Soviet republic since 2008, isn’t pressuring the country to accept greater exchange-rate flexibility, Tigipko said. Ukraine expects to receive the 7.8 billion hryvnia second tranche of the IMF loan and 2.8 billion hryvnia from other international lenders in the fourth quarter, the Finance Ministry said Oct. 6. 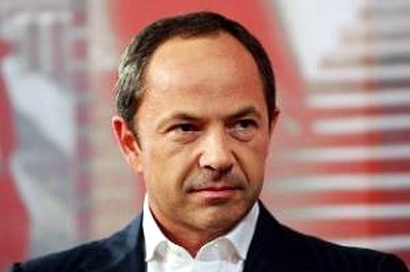 Tigipko said he saw no need to weaken the hryvnia to help Ukraine’s export-dependent economy. Ukraine’s economy, which grew 5.5 percent in the first half of the year, may expand between 4 percent and 4.5 percent this year, exceeding the government’s official forecast of 3.7 percent, Tigipko said. A slower pace of global recovery will restrain Ukraine’s expansion, he said. Inflation may be between 12 percent and 13 percent, matching the government’s previous estimates, according to Tigipko. The government is discussing imposing quotas on grain exports after crop losses sustained during record summer heat pushed food prices higher, he said.